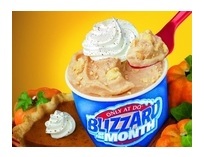 It is now officially fall, and that means Dairy Queen has gone ahead and released their Pumpkin Pie Blizzard once again. This is unquestionably one of the better Blizzard varieties out there, with the primary reason being that it tastes incredibly similar to an actual pumpkin pie. Speckles of powdered nutmeg can be found resting upon the dollop of whipped cream that acts as a crown to this decadent dessert. Underneath it was a thick yet still creamy concoction with a pale orange hue. The pumpkin taste was quite bold, with certain areas of the Blizzard standing out more than others. I'm not exactly sure how this was constructed, but it tasted as if pumpkin pie filling was simply mixed in with vanilla ice cream. There were tiny graham cracker pieces embedded throughout, which were reminiscent of Apple Jacks cereal due to the cinnamon flavor they contained. The vanilla soft serve came through as an aftertaste, so that component of the Blizzard wasn't completely subdued. All I have left to say is that I thoroughly enjoyed every bite. If you like pumpkin pie, there's no doubt that you'll love this as well. Better go out and get one while you still can! i had the dq pumpkin pie blizzard recently...and i gotta say, it was pretty yummy, overall. the pumpkin flavor was quite a bit bold at first, but i got used to it, as time went on. the nutmeg was a bit conspiratorial, making the pumpkin flavor seem a bit more up front, to my taste buds, at least. i gotta say this, this desert is not for every day consumption (that would be WAY too much for the average human to eat) but once in a while, to break the monotony of shakes, smoothies, and the like, this desert is the way to go.